Just had to share with your my latest designs using copper clay. I am having so much fun sintering this new clay in my MicroKiln. I seem to create a lot more designs then I use to with PMC and Art Clay Silver because it cost much less. We are talking about $17.99 for 50 grams of copper clay versus $75 to $82 for 50 grams of PMC or ACS. First - start out practicing with polymer clay (this will help you to get use to hand forming designs). 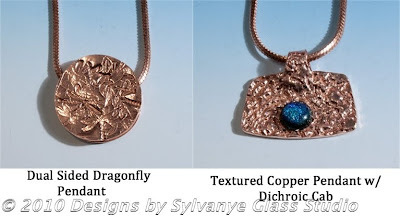 Second - use copper clay to practice and create designs becoming familiar with the feel and attributes of copper clay. Third - when you are satisfied with what you can do with copper clay, learn the differences between the metal clays and start creating fantastic fine silver designs.